Wedding Party | Wedding apparel and Party ! When Jennifer Lopez wants to make a statement, she does so with her clothing. The 44-year-old singer showed up to the Billboard Awards Sunday looking like a glamorous superhero in a red – and very plunging – sheer gown by Donna Karan. It didn’t appear to be an accident that the dress was reminiscent of the green Versace number she set tongues wagging with at the 2000 Grammy Awards. Since she was set to receive the Icon Award at Sunday’s ceremony, the Hypnotico singer made sure to look the part. The entertainer, who recently switched to a vegan diet, flaunted her long legs and tiny waist in a belted bodysuit that she rocked underneath the chiffon robe. Her hair – which was pulled off her face and into a semi up-do with added extensions – was virtually identical to the one she wore with the Versace dress. Since wearing the jungle-print Versace gown that plunged past her belly button, the Selena actress has consistently made best dress lists. Whereas her date at the Grammys was then boyfriend Sean Combs, she arrived Sunday with dancer and live-in love Caspar Smart, who at one point helped her splay out her gown for the cameras. Lopez appears to be thinking quite a bit about her stylish and shocking entrance at the Grammys 14 years ago: In her tongue-in-cheek new video for I Luh Ya Papi, she pays homage to the dress in the form of a very similar – and nearly as revealing – jungle print silk top and pants. Following her exciting red carpet arrival, Lopez slipped backstage and made a complete costume change for a performance with Pittbull. The Jenny From The Block singer donned a gold fringed onesie as she duetted with the rapper. Then later in the evening Lopez was awarded the Icon gong by Ricky Martin and Iggy Azalea honouring her for her work as an actress, a singer, a dancer, and a designer. She went on to perform her new single First Love ins a sequinned bodysuit before tearfully accepting the award. The star wore a one-sleeved sequin body stocking that hugged her famous curves and when performing, Lopez made sure to give the audience several views of her famous backside. She also changed her hairstyle, freeing her locks from her face and sweeping them over to the side. 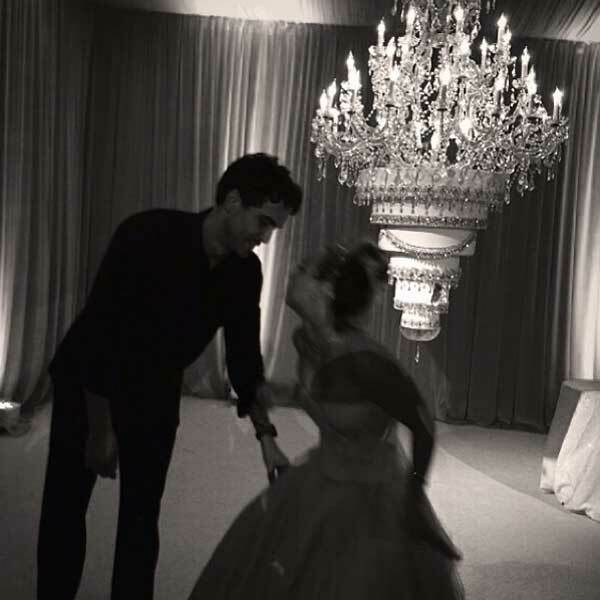 Kaley Cuoco got married to her beau of six months Ryan Sweeting on New Year’s Eve — and the Big Bang Theory actress wasted no time in sharing photos of “the greatest night of her entire life” with the world. The blushing bride posted snapshots of their fun-filled wedding on Instagram to give fans and followers a glimpse of their ‘fire and ice-themed’ celebrations. 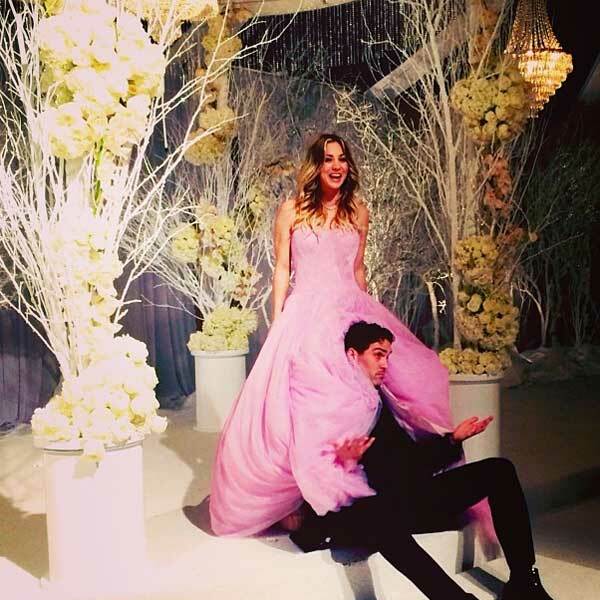 Wearing a blush pink Vera Wang gown, American actress Kaley couldn’t hide her happiness as she shared tender moments with her new tennis player husband. Their spellbinding wedding cake formed a central part of the celebrations. The chandelier-style showstopper was suspended from the ceiling above their dancefloor. The famous couple, who started dating just six months ago, tied the knot on New Year’s Eve surrounded by around 150 guests at Hummingbird Nest Ranch in Santa Susana, California. Their nuptials had a fire and ice theme. Despite getting engaged just three months after they got together, Kaley has said she feels like she’s known Ryan all her life. The relaxed photos show the newlyweds enjoying their first dance as well as a playful shot of Ryan wrapped in the lower layers of his new wife’s tulle gown. “From day one I just knew immediately and it’s been magic,” she said. Like her new husband, Kaley was once a nationally-ranked amateur tennis player, but she retired when she was 16. The sporty actress is now an avid equestrian and owns four horses. Prior to meeting Ryan, she had a brief romance with Man of Steel’s Henry Cavill, and she secretly dated her Big Bang Theory co-star Johnny Galecki for two years. Considering the fact that your favorite gal pals have shared some of your life’s most memorable moments, you surely want them to be bridesmaids to accompany you when you walk down the aisle on your wedding day. It is up to you to choose bridesmaid dresses that they will love to wear so be sure to keep your friends in mind when buying bridesmaid dresses. Remember that not all bridesmaid dresses look good on all women. Be sure to take your bridemaid’s figures into consideration when choose a dress style. A slinky, tight fitting dress may look great on a thin woman but it will not be so attractive on a heavier set gal. Most dress shops can help you choose the right dress type so be sure to mention that body shapes of your friends when choosing dress styles. Concerning color, today’s trend is to have bridesmaids dressed in different colors. This is a great opportunity for you to get your friends involved in the dress selection as you can ask each to select the color they like the best. It is no longer ‘in’ to have all bridesmaids looking the same so allow your friends to express themselves a bit. They can each wear whatever jewelry and other accessories they wish and can even pick out matching shoes of their choice. You can shop for dresses locally if you are willing to pay hefty prices but if you are on a budget you should shop online because you can find some really great inexpensive dresses on the web that your bridemaids will be proud to wear. There are numerous online retailers that specialize in inexpensive wedding dresses of all sorts so seek them out by conducting a simple search online. Do not forget to check out auction and classified sites as well because you can find some great new dresses that stores are no longer stocking this way. Today’s budget-conscious women are using sites like e-bay to shop for all types of dresses ranging from expensive and elaborate wedding gowns to cheap prom dresses so take advantage of these resources. Be sure that the dresses you choose match the theme of your wedding. For instance, if you are having a beach wedding you will want to choose casual dresses for your bridesmaids to wear rather than frilly gowns. You also want to be sure that the length of the dresses you choose are appropriate for the type of wedding you are having. Long dresses are right for very formal, old-fashioned white short beach wedding dresses should be worn for modern weddings.